What do Gwyneth Paltrow and I share in common? a) a multi millionaire husband? c) our love of Diptyque candles? Yes, it’s c) our reputed shared love of diptyque candles (just for info I am working on answers a) and b) – ha ha!) What have candles got to do with my blog post? Everything! 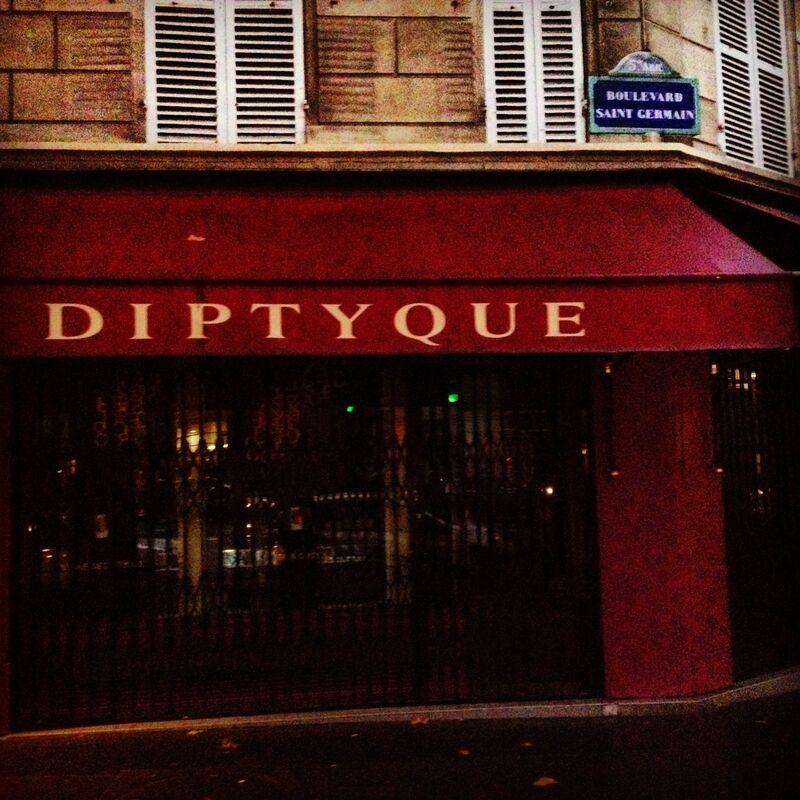 One of my favourite places to eat in Paris, so good that I am loathed to share it, happens to be a few doors down from number 34 Boulevard St Germain – the original home of Diptyque candles. I could wax lyrical (no pun intended) about Diptyque. They’re the only candles I have every bought that smell as they burn. They are worth every penny and smell so good! I love coming to Chez Gladines and especially this location a few doors down from my favourite candle shop. It’s also not too far away from the tourist kingdom of Notre Dame, Ile St Louis and the plethora of shops selling kebabs. Once you get tired of looking for Quasimodo turn left and keep walking – it truly is only 15 minutes away. They’re super friendly at this branch of Gladines and there’s a lovely big terrace – open in the summer and covered in the winter so that that dying breed of smoker can get their nicotine fix whilst grabbing a bite to eat. There are no white tablecloths here more retro 1950s style plastic chairs and tables. The chairs are surprisingly comfortable. The food here is basque inspired so chicken in a tomato based sauce, some steak, potato dishes etc. In fact everything on the menu is good and prices are very reasonable indeed. 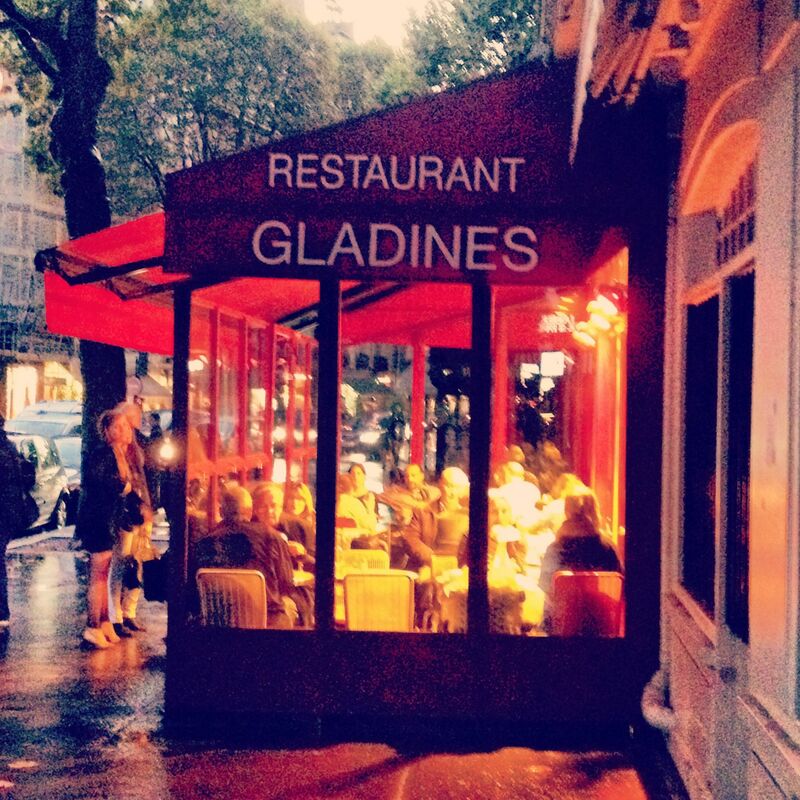 The month of October is a very lean month for most in France as it is the time when “les impots” or income taxes are due – which means there isn’t lots of spare cash to be flashed so thank goodness for places like Chez Gladines. A main course of basque style chicken will cost you €10,80 and a starter around the €5 mark and I recommend the rillettes €5,60. However, taxes aside there’s only one reason I come to Chez Gladines and that is for the salads. They are amazing and the whenever I bring a friend who is visiting from out of town, they look at me and say a salad is not a meal. 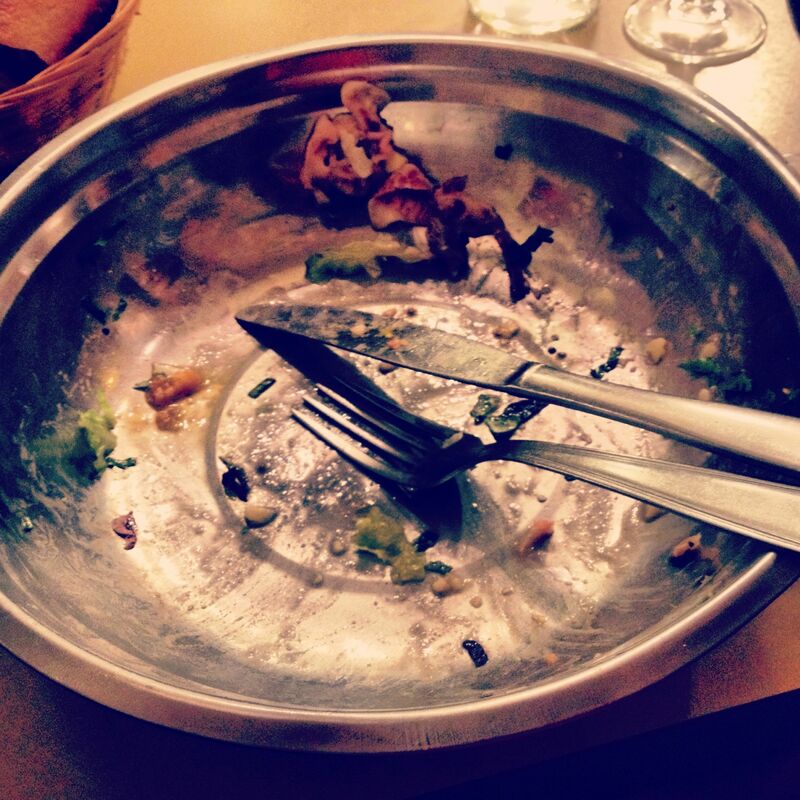 I tell them wryly – you haven’t had a salad until you’ve had a salad at Chez Gladines. 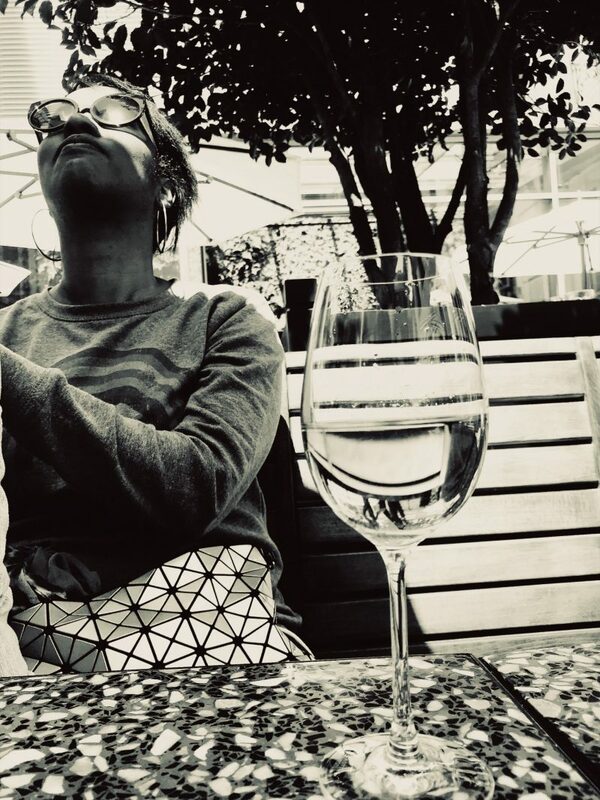 First things first, it was a Wednesday and I was in the mood for a glass of wine to take the edge of the pain of having to pay my income taxes. Wine starts at €2,70 a glass and a jug at €6. 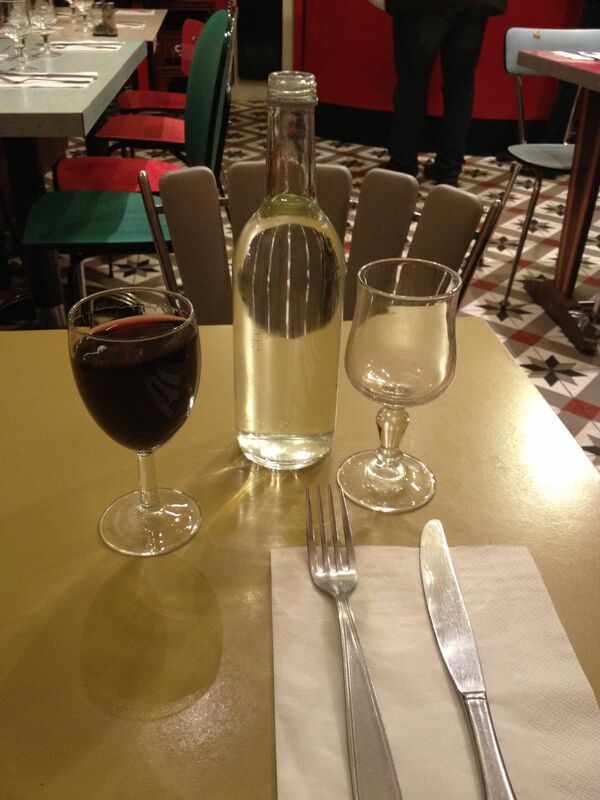 I chose a glass of delightful and full bodied Gaillac for €3. What are the desserts like here? I have no idea just finishing the salad is enough for me! I don’t say that lightly – only one of out of five of my friends that I’ve brought here has finished the salad they ordered. Are you up to the challenge? Pricey? My salad came to the princely sum of €8,90 + €3 for a glass of wine. 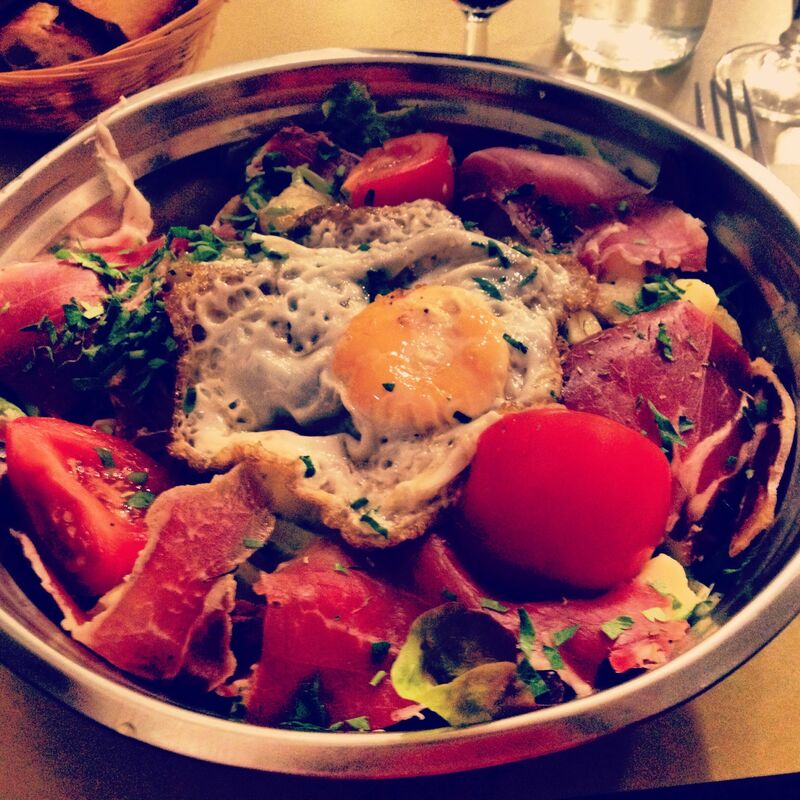 Cash only for dinner under €15 – Credit Cards are accepted for any bill over €15. I read this on a London bus and it made me want to book up for a trip to Paris so I could eat in all these hidey holes. Thanks for sharing. Not only interesting about food but the French challenges too.